Ace Combat Infinity: TUT Wants YOU! Alright, ladies and germs. Now that I'm finally back home, I can finally get around investing time in Ace Combat again. Currently, there's a special event featuring Team Deathmatch fleet battles, and I figured this was the best (haha, no) time to try and get some of you guys in here, so come on and in and let's talk planes. 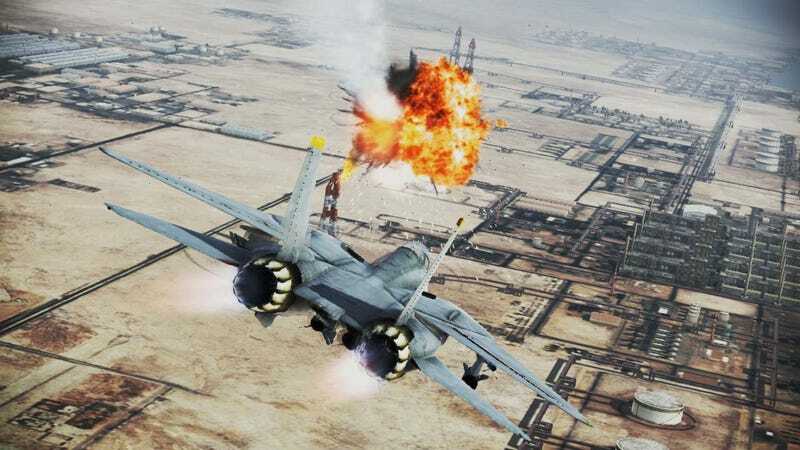 Ace Combat Infinity is Namco Bandai's current iteration in the franchise, and is set up in a F2P "arcade style" Air Combat game. You can go ahead and download it on the PSN store for PS3, and jump right in. It's unique or whatever in the "arcade" style, in the sense that you get a supplied fuel drop every 4 hours or so, but if you get hooked, you're more than welcome to give Namco your hard earned money, and buy some fuel yourself. Stocked fuel is also given out as item drops pretty commonly, though, so you can absolutely play the game and level up and unlock everything without ever having to reach for your wallet. The game does a pretty good job of teaching how the system works, and it's pretty straight forward, although it can have a pretty steep learning curve. I personally, love the game, and vouch for how addicting it can get, and was hoping maybe a few of you could give it a shot, since if there's one thing that's scarce in this game, it's friends to play with. It's a pretty common complaint I hear from other players. "Wish I had more buddies who were into this . .". SO, anybody up for it? Unfortunately, the deathmatches will only be available for a short time, and the clock is ticking. They, and other events, come and go, but it'll be a good month or so before it's back up again. And taking on an enemy fleet is super fun, so hop on.